In a move that seemed in response to the Evad3rs releasing their Untethered iOS 6.1 Jailbreak tool Evasi0n, Apple seeded iOS 6.1.1 Beta 1 to developers yesterday. The update included improvements to Maps in Japan as well as a few other optimisations, bug fixes, and improvements. However, it seems that is all iOS 6.1.1 does fix, with the security exploit used in the Evasi0n tool left wide open. 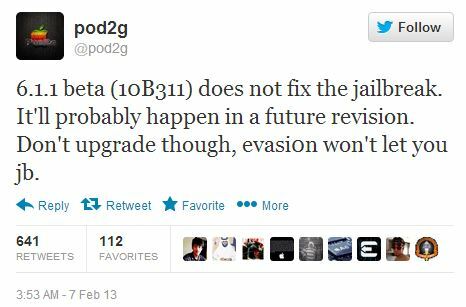 Pod2g confirmed in a recent tweet that the Untethered iOS 6.1 Jailbreak can still be used in the new iOS 6.1.1 Beta 1, confirming the new Beta didn’t in fact fix any security holes, or at least any associated with the Jailbreak. But don’t get too excited and go upgrading to the new Beta, Pod2g warns that the Evasi0n tool won’t actually let you use it on iOS 6.1.1. It is likely that Apple will patch the Jailbreak in iOS 6.1.1 Beta 2, and we’ll probably see that quite quickly. But given iOS 6.1 was released only 9 days ago, it would appear Apple rushed to get this Beta out, but it is unsure why rushing such an update out did not fix the security hole that Evasi0n uses. Either way, the reasons behind Apple’s decision not to fix it remain a mystery, but one thing is for certain – do not upgrade to iOS 6.1.1 Beta 1, unless of course you don’t care about your Jailbreak. Did you already hit the update button? Do you not really care about the Jailbreak? Let us know in the comments section below.